Volvo Buses has announced that the world’s first full-size autonomous electric bus, a 12 metre-long single-deck bus with a capacity of almost 80 passengers (36 seated) is now undergoing field trials in Singapore. 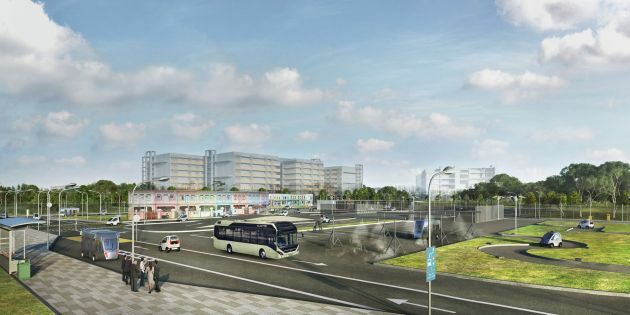 The bus has been developed with Singapore’s Nanyang Technological University (NTU), whose partnership with the city-state’s land transport authority (LTA) has seen it develop and conduct autonomous bus trials for fixed route and scheduled services. The autonomous bus is a Volvo 7900 electric bus equipped with sensors and navigation controls handled by an artificial intelligence (AI) system, and is the first of two buses which undergone preliminary testing at the Centre of Excellence for Testing and Research of Autonomous vehicles at NTU (CETRAN). The sensors include light detection and ranging sensors (LIDARS), stereo-vision cameras that capture images in 3D, and an advanced global navigation satellite system that uses real-time kinematics, says Volvo. These are connected to an inertial management unit (IMU) which measures the lateral and angular rates of the bus, aiding in navigation over uneven terrain and around sharp bends for a smoother ride. The bus will be tested on NTU campus grounds, while the second autonomous Volvo 7900 bus will undergo tests at an SMRT-managed bus depot, and will assess the vehicle’s ability to autonomously navigate into vehicle washing bays and park safely at charging areas. Volvo partner ABB will also be developing a fast-charge solution, one that is based on the OppCharge concept and is suited for autonomous charging in depots as well as in running traffic, the busmaker said. Charge of 300 kW is offered via a pantograph on the infrastructure, and the setup will recharge a bus battery in three to six minutes, it said. The post Volvo unveils autonomous bus for testing in Singapore appeared first on Paul Tan's Automotive News. 0 Response to "Volvo unveils autonomous bus for testing in Singapore"